But when she meets Ivan, a handsome Argentinean man with a humble sailboat and a dream to set off exploring the world, Torre has to face a hard decision: watch the man she's in love with sail away forever, or head off on the watery journey with him. Suddenly the choice seems simple. She gives up her sophisticated city life, faces her fear of water (and tendency towards seasickness) and joins her lover on a year-long voyage across the Pacific. 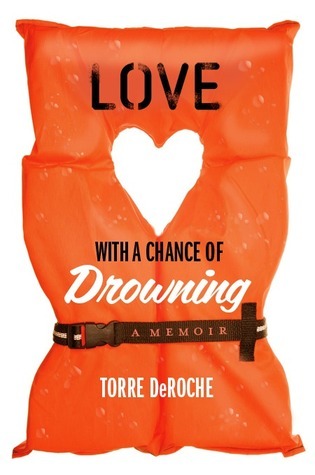 Set against a backdrop of the world's most beautiful and remote destinations, Love with a Chance of Drowning is a sometimes hilarious, often moving and always breathtakingly brave memoir that proves there are some risks worth taking. I am so excited to share this book with you all! You may think it sounds a bit familiar to a review I wrote two years ago, and you'd be right! Two years ago, my first review for The Sweet Bookshelf was for a self-published memoir called Swept: Love with a Chance of Drowning. I loved and adored that book and now follow the author's (hilarious!) blog and her continued adventures (www.fearfuladventurer.com). Shortly after I reviewed Swept..., it was pulled from availability because the author sold her book to several publishers world-wide, and also sold the movie option. Talk about an author's dream come true! After two long years, the book is finally being released on May 16, 2013! Put this book on your must-read list, everyone. It's fabulous. Who could resist a smart, funny, sassy story about someone with a fear of water who gets up the gumption to sail across the Pacific in an aged sailboat with a guy she met in a bar? I’m a sucker for travel and the ocean and quickly fell in love with Torre’s beautiful, relaxed writing style, blunt humor, biting wit and great descriptions of life at sea. Her fear of deep water both cracked me up and hit close to home for me – I have a fear of dark water and all things that I can’t see in said dark water. But at the same time I long for and LOVE the ocean and would live in it despite that fear, if I could. If you like travel, romance, humor, sailing or if you’re just looking for a great tale about overcoming one’s fears and bettering life in the process, you’ll LOVE this book. I laughed, I longed for the sea, I dreamed of the destinations in this story and lived out the adventures as I inhaled this book; It swept me away. Sounds good! Oh the things we will do for love.